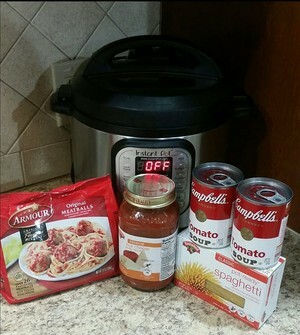 Place frozen meatballs on bottom of pot. 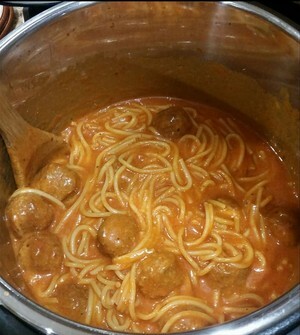 Arrange 1/2 lb spaghetti in crisscross method on top of meatballs. Mix tomato soup and 1/2 jar sauce together in separate bowl with spices and sugar. Add sauce on top of pasta, making sure to cover pasta. Set pot to cook 5 min on high, then 5 min NPR. After NPR, stir well. It will be watery at first but will thicken as you stir. Add cheeses and continue to stir. Once melted and thickened, serve.